Malnutrition has greatly contributed to Vietnamese people’s shortness compared with other countries in Asia and Europe, according to the National Institute of Nutrition. Vietnamese men are 163.7cm tall on average – 13.1cm shorter than the World Health Organisation standard. Vietnamese women are 153cm on average – 10.7cm below the standard. Compared with other countries in the region, Vietnamese people are on average about 8cm shorter, according to Le Bach Mai, deputy director of the National Institute of Nutrition. The clearest difference in height between Vietnamese people and others is seen in children 6-12 months old and 6-11 years old. In 2014, 24.9 percent of children under 5 were malnourished and 14.5 percent underweight. The highest proportions were seen in the Central Highlands, the northern mountains and mid-land areas. According to statistics from a nationwide survey on micronutrients released earlier this month, the lack of nutrients is decreasing, but slowly. It’s still common in children and pregnant women. The rate of anaemic children is 27.8 percent, and 32.8 percent for pregnant women. Thirteen percent of children under 5 have a vitamin A deficiency. 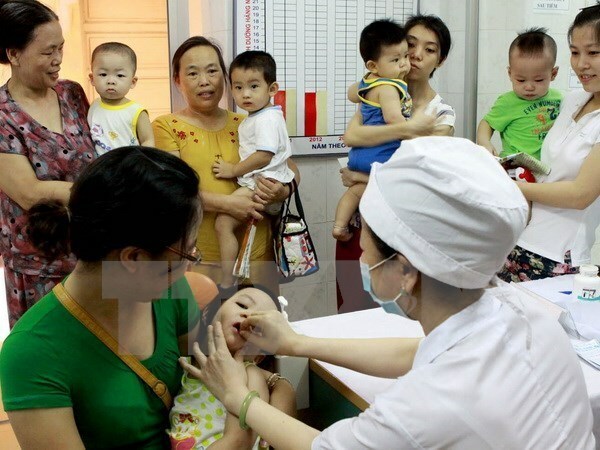 Nutrition experts affirmed that genetic heredity is not responsible for Vietnamese people’s shortness. Vietnamese children who are born and grow up in Europe grow as tall as those in their host country. The experts said children’s meal portions have yet to meet necessary standards for growth. Currently they only get 60.3 percent of the required calcium and 10.6 percent of the required vitamin D.
Factors that affect children’s height and weight mainly occur in the foetal stage and in the first two years, they said. So it is vital to provide the correct micronutrients to children during those periods. Daily iron and folic acid supplements for pregnant women and for a month after they give birth are extremely important to prevent anaemia.